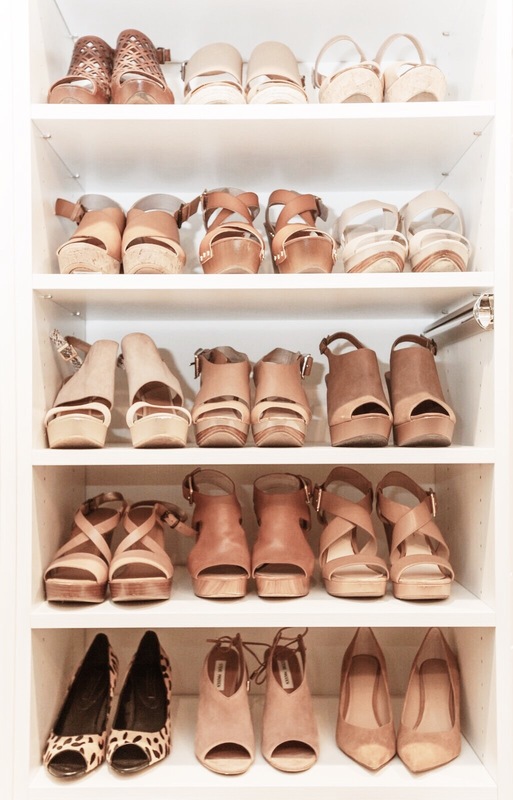 Today I’m sharing my new closet with you (this post may be a bit lengthy)! 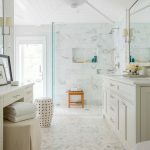 The master closet was just one part of an overall renovation that consisted of a new master bedroom, bathroom, powder bath, office and outdoor living space. 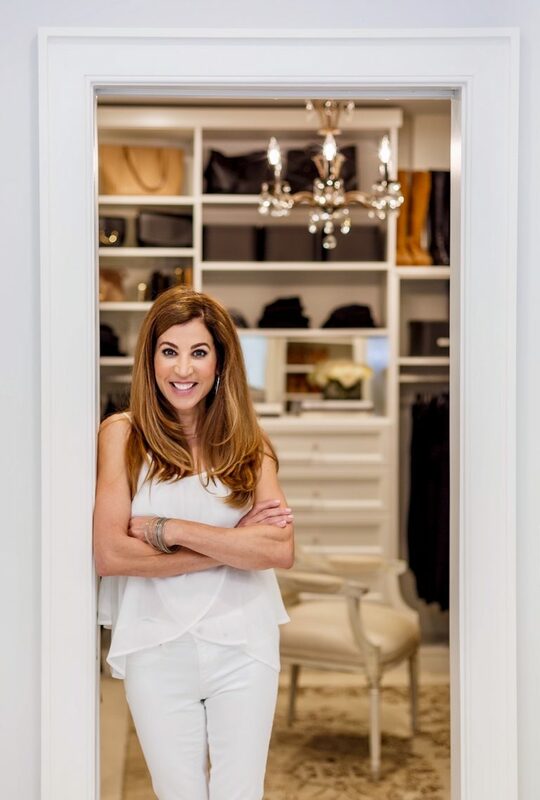 The master closet was one of the most important areas of the renovation for me. Not only because I’m a women, but I share the closet with my husband. Most women gasp at the thought of that! In November we will have been married 30 years and some of our best conversations have occured in the closet and I didn’t want this closet to be any different. I was very fortunate to work with a great team and one of the most important lessons I learned is sometimes a job is too big to tackle on your own and you can’t be afraid to ask for help (even if you’re an organizer)! I knew I needed help putting my ideas on paper and having used California Closets previously thats where I began. A friend referred me to Betsy and after our first meeting I knew we were going to come up with the perfect design to fit my needs. As an organizer I wanted to make sure every bit of space was utilized. For that reason I chose to use a mirrored pocket door to give more space in the room. I described all of my needs and showed her my exisiting closet. I gave her a list of what was working and what was lacking. I also wanted to make sure there was adequate drawer space for me and my husband. 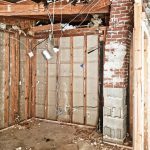 After measuring the space for the new closet, which was nothing but a plywood floor, four walls and no lighting, she took all of the information back to her drawing board. We exchanged emails with minor changes and I went to the showroom to get a closer look at my options. I knew I wanted white cabinets because they always look neat and clean and never outdated. There were many options so I was glad I was able to go to the showroom and see them in person. I wanted the hardware to blend with the bathroom cabinet hardware because when the door is open you can see them both. I decided to use the Grafton Pull in polished nickel from Restoration Hardware and it was perfect! 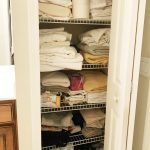 Working with a professional closet designer helped me figure out how to use odd spaces that can’t be changed. We had to deal with an electrical panel in the corner and it became the perfect spot for tall boots. I even turned useless wall spaces into a home for belts and jewlery. The important add ons were tie racks and valet bars and that made for a happy husband. After the closet was installed the organizer in me took over and I decided to do what I do best, organize. 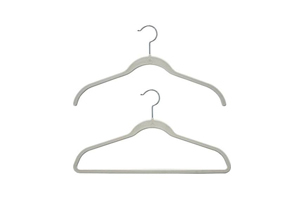 I chose black hangers but really its a matter of preference. The imporant thing is that you keep them are all the same color. I put like things together and color coded. I used boxes on the shelves for winter items and travel assecories, an acrylic collator for smaller handbags and acrylic shelf dividers to keep my t-shirts neat and organized. My out of season shoes are stored on an upper shelves and my everyday shoes fit perfectly side by side in the tall unit designed just for shoes. I was already working with my designer Kelly at Orangerie Home on the plans for this project so now I was ready to have her work her magic on the final touches in the closet. Kelly suggested bringing in an antique chandelier that I already owned and mirroring the small back wall above my center drawers. I love how one mirror makes the room feel even larger. The area rug she chose brought in the warmth I was looking for. We are still looking for the perfect bench and when we find one I will be sure to share! Next up the organizers bathroom so make sure to subscribe to get all the latest posts.